Leicester made a winning start to life after the dismissal of Craig Shakespeare as they outplayed Swansea City to earn only a second Premier League victory of the season. The visitors created a host of chances and took the lead when Federico Fernandez headed into his own net from Riyad Mahrez's whipped cross. A swift counter-attack saw Shinji Okazaki score Leicester's second early in the second half, before Alfie Mawson hooked in from close range to spark hopes of a Swansea revival. But the sluggish hosts struggled to create scoring opportunities as they slumped to a fourth defeat from five home league games this season. "It is very difficult when you lose the manager and I wasn't sure what response we would get," said 41-year-old former Oxford boss Appleton, who took charge following Shakespeare's sacking on Tuesday. "It has been a difficult week. To produce that performance after the week we have had, the players deserve a lot of credit. "One game doesn't make you a Premier League manager and I'm very aware of that. "But I'm also aware that I'd like to think as an assistant I'm more than capable of doing that role. "I've done [the assistant role] twice now - I had 15 months at West Brom and here at Leicester - and I'd love an opportunity to continue to do that." Victory lifts Leicester up to 13th in the table, while Swansea drop to 15th, level on points with Stoke in the relegation zone. This fixture had become synonymous with managerial change, starting two seasons ago when a Mahrez hat-trick gave Leicester a 3-0 win and consigned then Swansea boss Garry Monk to the sack. Last term, it was a 2-0 Swans victory which proved to be Claudio Ranieri's final game as Leicester manager and, this time, the Foxes responded superbly to the departure of Ranieri's successor, Shakespeare. Appleton could have had a goal within one minute of his tenure's start as Okazaki had a header saved by Lukasz Fabianski, and the Polish goalkeeper was at full stretch soon after to tip over Marc Albrighton's firm effort. The verve in Leicester's play and the frequency with which they carved Swansea open was in stark contrast to the uninspiring draw at home to West Brom on Monday which had ultimately cost Shakespeare his job. The only concern for Appleton was that his players had not turned their superiority into a wider winning margin, though those worries were eased with a second goal four minutes after the interval. It was a goal which typified Leicester's display, with Albrighton instigating the counter-attack with a darting run and chipping ahead to Mahrez, who squared the ball for Okazaki to tap in from close range. 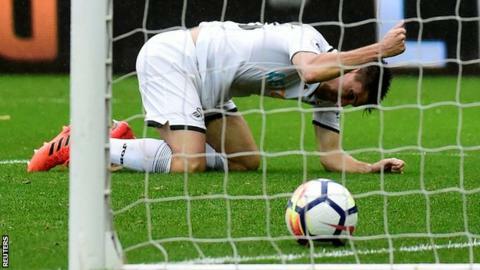 Swansea ended a run of three successive home league defeats with victory over Huddersfield last week, though their insipid start against Leicester suggested their improvement at the Liberty Stadium would be short-lived. Tammy Abraham scored both goals against Huddersfield but the striker on loan from Chelsea had no service or support from his team-mates on this occasion, as the home side struggled to cope with the high tempo set by their energetic opponents. Even though Okazaki's goal appeared to have opened the floodgates for Leicester, Swansea gave themselves an improbable route back as Mawson struck from a corner, turning smartly and firing into the bottom corner. It was a goal from nothing and, although Leicester retreated in the closing stages, they seldom seemed troubled by their unimaginative hosts. Swansea launched a few balls forward in hope rather than expectation and, despite a couple of half-chances for Wayne Routledge and Jordan Ayew, this was another poor performance which laid bare the shortcomings of Paul Clement's side. "The performance in the first half was what let us down," said Clement. "Their first goal was marginally offside but from a performance point of view we have to be better. We made a step back. "It was frustrating and I'm disappointed to have gone backwards." Mahrez has had a hand in two goals in his last two Premier League games (1 goal, 1 assist), as many as in his previous 10 in the competition. Leicester host Leeds United in the fourth round of the EFL Cup on Tuesday at 19:45 BST. Swansea will look to bounce back at home to Manchester United in their EFL Cup fixture on the same night. Match ends, Swansea City 1, Leicester City 2. Second Half ends, Swansea City 1, Leicester City 2. Attempt missed. Tom Carroll (Swansea City) left footed shot from outside the box is high and wide to the left. Attempt missed. Wilfred Ndidi (Leicester City) right footed shot from outside the box misses to the left. Assisted by Christian Fuchs. Attempt missed. Andy King (Leicester City) right footed shot from outside the box is too high. Assisted by Jamie Vardy. Attempt missed. Wayne Routledge (Swansea City) right footed shot from the centre of the box is close, but misses to the left. Assisted by Ki Sung-yueng. Attempt saved. Jordan Ayew (Swansea City) right footed shot from outside the box is saved in the bottom right corner. Assisted by Ki Sung-yueng. Corner, Swansea City. Conceded by Vicente Iborra. Attempt blocked. Jordan Ayew (Swansea City) right footed shot from long range on the left is blocked. Offside, Leicester City. Andy King tries a through ball, but Jamie Vardy is caught offside. Attempt saved. Federico Fernández (Swansea City) header from the right side of the box is saved in the top right corner. Assisted by Tom Carroll with a cross. Attempt blocked. Tom Carroll (Swansea City) left footed shot from outside the box is blocked. Jordan Ayew (Swansea City) wins a free kick in the attacking half. Substitution, Swansea City. Wayne Routledge replaces Renato Sanches. Attempt missed. Riyad Mahrez (Leicester City) left footed shot from outside the box is close, but misses to the right. Attempt saved. Jamie Vardy (Leicester City) right footed shot from the centre of the box is saved in the bottom right corner. Assisted by Riyad Mahrez with a through ball. Attempt missed. Ki Sung-yueng (Swansea City) left footed shot from outside the box is high and wide to the left. Assisted by Kyle Naughton. Substitution, Leicester City. Andy King replaces Shinji Okazaki. Attempt missed. Kyle Naughton (Swansea City) left footed shot from outside the box is too high. Assisted by Nathan Dyer. Corner, Leicester City. Conceded by Ki Sung-yueng. Corner, Leicester City. Conceded by Alfie Mawson. Corner, Leicester City. Conceded by Federico Fernández. Delay in match Tammy Abraham (Swansea City) because of an injury. Attempt missed. Tammy Abraham (Swansea City) header from the centre of the box is high and wide to the right. Assisted by Kyle Naughton with a cross. Substitution, Swansea City. Nathan Dyer replaces Luciano Narsingh.